I hope everyone had a wonderful Thanksgiving with turkey, family, friends, and all the football you wanted! Now it's time for us to get ready for the 2009 B&B Holiday House Tour which will take place Sunday 12/6 from 1:00 PM to 5:00 PM. Our local B&B association members have been decorating their homes, baking cookies, and making final preparations for the tour to benefit Project S.H.A.R.E. - our county food bank. There was a wonderful article in the Carlisle Sentinel newspaper today and a beautiful ad in the Harrisburg Patriot News on Friday. Eight of our member B&Bs will be featured on the tour. Some homes will have musical entertainment while others will provide light refreshments. Ticket holders will have a chance to win a stay at one of the member B&Bs. We still need to put up our Christmas tree. It's Chuck's turn to choose the tree... That means it will be a very round tree! We'll be looking for just the perfect fraser fir tree - small enough to fit in my truck and big enough to fill the complete picture window! 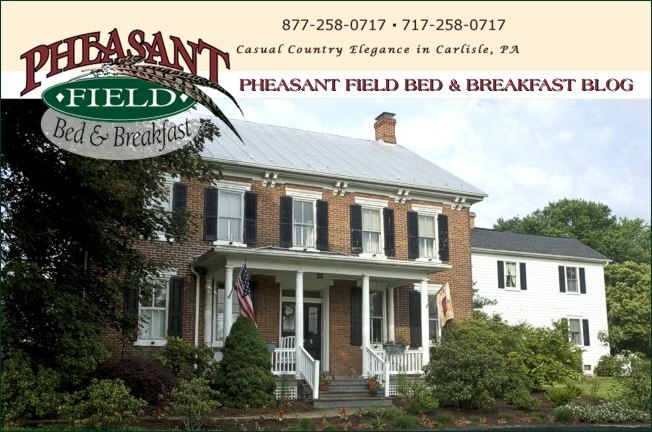 "It's beginning to look a lot like Christmas" at Pheasant Field Bed & Breakfast!